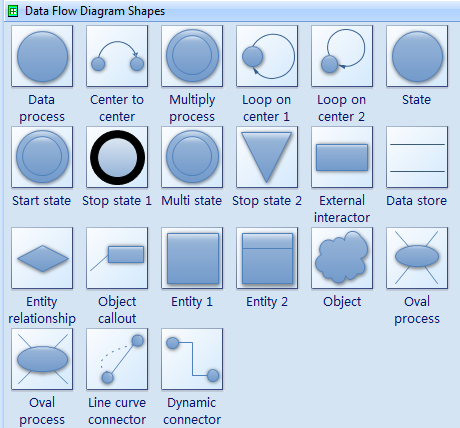 Data Flow Diagram Software - Provides some useful data flow diagrams resource such as how to create data flow diagram, data flowchart examples and data flowchart software. A DFD usually comprises of four components. These four components can be represented by four simple symbols. These symbols can be explained in detail as follows: External entities (source/destination of data) are represented by squares; Processes (input-processing-output) are represented by rectangles with rounded corners; Data Flows (physical or electronic data) are referred to by arrows; and finally, Data Stores (physical or electronic like XML files) are presented by open-ended rectangles. See how DFD symbols are used in examples. What is an Entity Relationship Diagram ERD?